Walking in to check on the eagles last week and knowing that I could get near the nest, I wondered what I would find...if anything. Although I have seen the immature regularly flying over the yard in the past few weeks, I've only heard the adults once or twice. 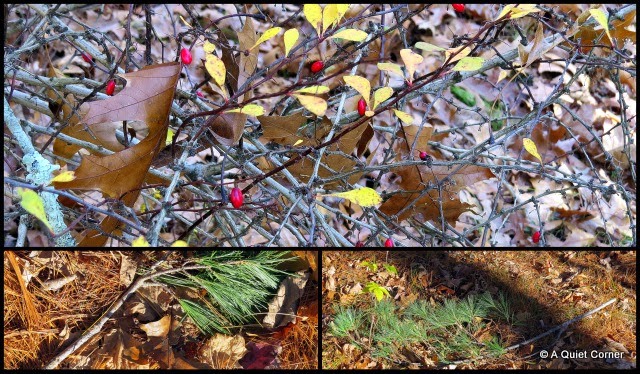 However, when I scanned the area for activity, I noticed fresh sprigs of pine here and there. Looking up, I saw that a few home improvements have begun. 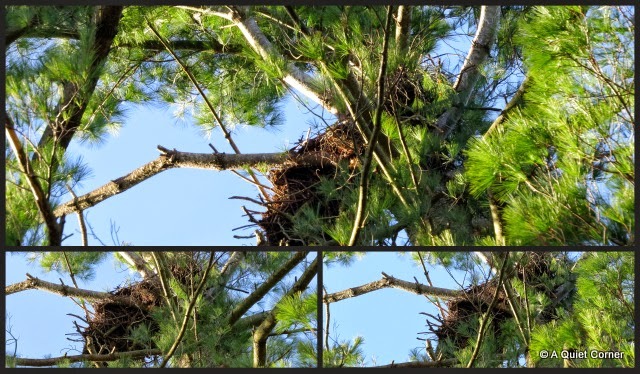 It is not unusual for a nesting pair to build a new nest so I need to keep my eyes open in case they decide to build elsewhere. 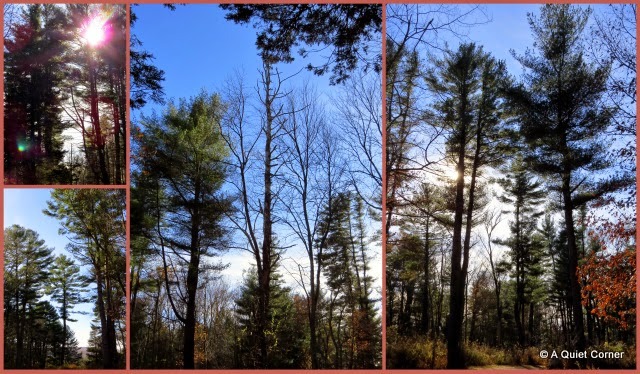 Looking back as I left, I noticed the sun peeking through the pines near the nest, a comforting way to end my walk. That does look like a lovely and quiet spot! Hope you get a sighting of the eagles JP. The photo of the trees and the sun is beautiful. Wonderful to see these beautiful birds so close to your home. Beautiful photos. So has it come full circle? Do you think the babies are now nesting and mating? Do the nest renovations mean more eggs are in the near future JP? Too bad you couldn't have one of those 'in tree' things hunters use to get you higher for photos. I hope they stay around and don't move out of the area! Don't they know you'll worry? I'm glad the eagles seem to be settling in. Beautiful photos. I love when there is new construction in the neighborhood. pretty tree mosaic. hopefully they will stay put.